The historic Esala Perahera in Kandy began on July 18, with the usual installation of the kapa (sanctified log) at the devales dedicated to the four guardian gods Natha, Vishnu, Kataragama and goddess Pattini. It will be followed by the Devale peraheras from 18 to 21, and by the Kumbal perahera from 22 to 26. 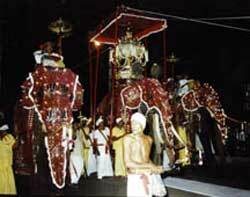 The Randoli Perahera, the most grandiloquent of the peraheras will parade the streets from 27 to 31. The ritual of the water-cutting ceremony will be held on August 1, followed by the Day perahera on the 2nd thus, bringing the grand spectacle that the community invests in each year to an end. Seven days after the Day Perahera, as tradition holds, Waliyaknetuma (an abridged form of Kohomba-Kankariya) is danced at the Vishnu Devale, by people of the Balibat caste, for seven more days, with masked dancing, to avoid malignant influences. This is a general account of the Esala perahera in Kandy, which has changed in detail down the ages, e.g., during the Kandyan period two peraheras were held, one by evening and one by night, preferably during the Randoli perahera. The Esala perahera in Kandy dates back to the reign of Kirti Sri Rajasinha (1747-1780). It is a combination of the Dalada perahera, and the four Devale peraheras dedicated to the guardian deities of the island. Earlier, the Esala perahera was conducted exclusively to appease the divinities, and patronized by the Malabari kings of South India, who ruled the Kandyan provinces. They were Hindus. The month of Esala is reminiscent of Esala Dev-keliya ('play of the gods'). How the band wagon of the Dalada perahera came to be merged with the four devale peraheras, has an interesting story. When the bhikkus from Siam (Thailand), headed by the Most Ven. Upali Maha Thera, came to Sri Lanka, to bestow the defunct Upasampada (the highest ordination qualifying a bhikku), their arrival coincided with the Esala festival in Kandy, when preparations were under way to hold the devale peraheras invoking the blessings of the gods for the king and his subjects. The Maha Thera Upali, having heard the noise of jingalls (a kind of large Indian swivel musket), inquired from the king the reason for all that noise the king told the Maha Thera that arrangements were being made to hold the Devale peraheras, during the month Esala, to appease the gods and to receive their blessings. The Maha Thera immediately took umbrage over the news, and at the attitude of the king in giving preference to Hindu customs, in a land where orthodox Buddhism has gained ground for more than one thousand years. The king, realising his mistake and using his wits, not to offend the Maha Thera, informed him that Dalada perahera will lead the procession followed by the Devale peraheras, in their order of importance. There had been, throughout history, processions of great magnitude which could be considered as the precursors of the present day Dalada perahera. When the 'danta dhatu' (Tooth Relic of the Buddha) was brought to the island by prince Danta and princess Hemamala of Kalinga (Orissa), during the reign of Kirti Sri Meghavarna (352-377), the three Buddhist fraternities in Anuradhapura (Mahavihara, Abahayagiri vihara and Jetavana vihara), claimed to possess it as the most revered object of worship. The king, wishing not to displease the bhikkus of the three viharas, placed the Relic in a golden reliquary, and keeping it in his royal chariot, allowed to go to one of the three viharas. The chariot unguided went to the Abahayagiri vihara, and the bhikkus thera accepted it and enshrined it in a gaily decorated 'dhatugruha' (relic chamber). It later became the palladium of regal authority. The Mahaviharavasins and the Jetavanavasins did not claim it. Before the transfer of power from Anuradhapura to Polonnaruwa in 1058, the Tooth Relic was annually taken in procession from the vihara to the city of Anuradhapura and back to the vihara, with great pomp and ceremony. It was the beginning of the Dalada perahera in the island. The significant and widespread belief regarding the origin of the Esala perahera is woven into the fabric of mythology, especially in regard to the water-cutting ritual. During the reign of Vankanasika Tissa alias Kasubu (109-112), a band of Cholians from South India, invaded the island, and having slain the king, took away 12,000 Sinhala captives to South India. His son, king Gajabahu, along with his herculian soldier Nila, crossed the Indian Ocean to India, by cleaving the waters of the sea with his massive iron rod. After peaceful negotiations with the Colian king Senguttuvan, king Gajabahu was able to bring back the captives, along with an equal number of Cholians, in recompense. Later, they settled down in the villages of Hewaheta, Tumpane, Udunuwara, Yatinuwara, Alutkuruwa etc. The water-cutting ritual at the Getambe ferry reminisces the exploit of Nila in cleaving the sea to go to India. King Parakramabahu I (1153-1186) of Polonnaruwa, held a Dalada perahera, when there was a severe drought in the country threatening a famine. The following day, rains came down in torrents inundating the low-lying areas, and filling the lakes that had gone dry. In the Dalada Siritha, a treatise on the Tooth Relic, it is said: "Vesi novasnakala mama lesin Dalada pooja karanawa isa". (When there is no rain, make offerings to the Tooth Relic in this manner). There is belief among the Buddhists that whenever there is severe drought, the Tooth Relic should be carried in procession. History tells us that during the governorship of Sir Edward Barnes (1824-1831), a Dalada perahera was held in Kandy in 1829, on the advice of the Kandyan chiefs, to avert a severe drought. It resulted in a heavy downpour when the flood waters spilled over the Kandy lake submerging the low-lying areas, and making roads impassable. The flood waters came to be known as the Dalada Watura (Relic water). The governor was surprised over the miraculous power of the Tooth Relic, about which a despatch was sent to the Colonial Secretary in England. The Esala perahera ritual complex begins with the installation of kapa, a pole about four feet in height, within each devale. A few days before the new moon in August, the Basnayaka Nilames of the four devales, along with the kapuralas, go in search of a young jak tree (Artocarpus integrifolia), that has borne no fruit, and clear the ground around the tree. it is then fumigated with the smoke of burning resin and sprinkled with specially prepared sandalwood water. Flowers, betel leaves and a lighted lamp are placed at the foot of the tree, and the deity, whose abode, perchance, it may be, is implored to leave the tree, before it is felled. Earlier an asala tree (Cassia fistula) was selected, instead of the lactiferous jak tree, to make the kapa poles. Once the tree is felled, it is cut into four equal parts and distributed among the four devales, the Natha devale getting the first kapa. The traditional procedure followed in felling the tree is mentioned in the Sinhala text Maimataya (Skt. Mayamata). Each log is carried in procession and planted inside the devales. Earlier they were installed outside the devales, but now having reduced in size, they occupy an elevated ground inside each devale, specially built for the purpose. It is known as kap-situweema. For five days from the date of installation of the kapa, the kapurala of each devale take around the log every evening (formerly twice a day), accompanied by music and drumming, flag and canopy bearers and spearmen and the sacred insignia of the gods (ranayudha). This takes the form of a little procession in each of the devales, and is known as Devale perahera. On the fifth day, the insignias are taken out of the devale premises and borne inside a dome like structure, known as the ranhilige, on the back of an elephant, accompanied by the Basnayaka Nilame and his retinue. The Devale peraheras come at the appointed hour and assemble in front of the Dalada Maligawa. The Relic casket, which is a substitute for the Tooth Relic, is placed inside a ranhilige, which is tied on to the back of the caparisoned Maligawa elephant. The Maligawa perahera joins the waiting Devale peraheras in front and gives the lead in moving on. The perahera consisting the Maligawa and Devale peraheras march through the prescribed streets, and it is called the Kumbal perahera. Randoli perahera is an expanded version of the Kumbal perahera, to which are added palanquins (randoli) of the four devales. These contain the ornaments of the goddesses, sword and pitcher of each devale. On the 5th day of the Randoli perahera, after a short break up, reassembles and makes its way to the Asgiri vihara, where the casket is placed, and the Devale peraheras return to their respective devales. Later in the night the four Devale peraheras make their way to the water-cutting site at Gatambe ferry. At the river the kapuralas of the devales are led in a decorated boat to some distance, from where they cleave the waters with the sacred sword, and collect a pitcher full from the place where the sword touched the water, to be stored in the devales for one year, to be fed back into the river, at the next water-cutting ceremony. On their way, the peraheras stop at the Ganadevi Kovil, Kandy, where the assembled crowds received the blessings of the gods, in the form of a tilaka (prasada) of sandalwood paste on the forehead. In the afternoon, the peraheras of the four devales form into one unit and go to Asgiri vihara to join the Maligawa perahera. Thus, the full procession is formed again and the Day perahera, takes a prescribed route and goes back to the Maligawa, where at the prescribed auspicious moment, the casket is replaced at the sanctum sanctorum. The introduction of Ves dancing to the perahera is of recent origin. Ves is a sacred dance. The ves-tattuwa (the magnificent head dress of the Kandyan dancer) is a sacred object guarded by a system of taboos and traditions. As a form of dancing Ves is considered fit for the gods. The Diyawadana Nilame, Punchi Banda Nugawela Nilame (1916-1937), who introduced it to the Maligawa section of the perahera, has made this great change. In 1828, when Governor Barnes participated in the Dalada perahera, the Maligawa perahera consisted of the following: (1) Peramune Rala riding the Yahalatanne elephant. (2) Gajanayaka Nilame carrying the symbolic goad. (3) Kodituwakku Nilame and his retinue. (4) Disava of Four Korales. (5) Disava of Seven Korales. (6) Disava of Matale. (7) Disava of Sabaragamuwa. (8) Disava of Walapone and (9) Disava of Udapalatha, each carrying their respective flags. Today, the provincial representation has been forgotten. The Kodituwakku department is absent. The Peramune Rala and Gajanayaka Nilame are solitary representatives. The extinction of old elements and the substitution of new elements have, doubtless, harmed the original integral symbolism of the Esala festival. The elephants are less in number than in the old days, when more than one hundred elephants participated in the perahera. The winds of change have affected the old customs and rites to a reasonable degree.